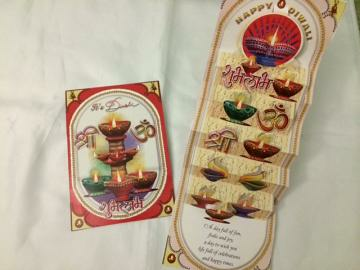 Diwali greeting card for anyone in your diwali gifts list. It is a pop-up card with traditional print. Buy Diwali Greeting Card with Traditional Print, sold & shipped by Yaadein where you can shop online for Pooja Samagri, Hindu Statues, Puja Items, Religious Gifts & Home Decor. This Diwali Gifts collection has been tagged as greeting card, diwali wish, send deepavali gifts to usa, hindu festival, cards gifts.